I feel like everyone at the moment is talking about Sophie Hulme, and rightly so. She makes classic pieces with a real structured, tough edge. There’s something quite masculine about her clothes which I’m drawn to. She makes beautiful boxy clutches and totes, but today I’ve dedicated my love to one item and one item only. 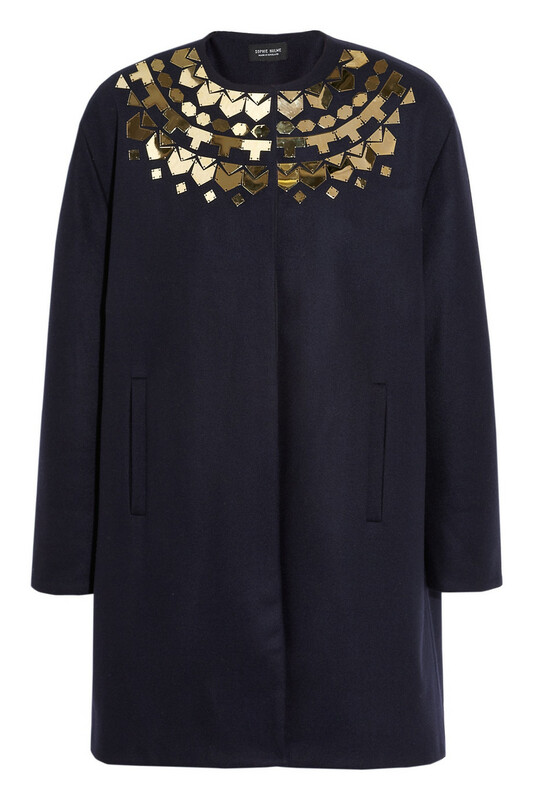 This Sophie Hulme Embellished Wool Coat from Net-A-Porter. Firstly, I love how this coat is navy. I always tend to buy black coats but navy is more subtle and actually a lot more flattering on my pale skin tone, as I’m blonde with blue eyes. The gold embellishment around the neckline compliments the colour and adds a bit of sparkle. It’s a great cut, boxy but with slim shoulders so it’ll just skim the body. It looks like they’re 3/4-length sleeves too so would look fab pushed up at the elbows. Imagine this draped casually over your shoulders, that’s what I’m doing right now. Especially as it’s £980. Have you got a favourite Sophie Hulme piece? "Two Birds, One Stone and the Perfect Dress for a Spring Wedding"